News Flash!! Eric Shoaf, Burroughs bibliographer extraordinaire, is still out there; he is still searching; he is still finding. In 2018, Shoaf send me a copy of Gonzology: A Hunter Thompson Bibliography. It is an impressive piece of work, with 293 items in the magazine section alone. I highly recommend picking up a copy if you are interested in el Gonzo or just interested in books and magazines generally. As a bibliophile, I love looking through a good bibliography and Shoaf’s book, which allows a look into the world of the mainstream and the underground media, is fascinating stuff. This is an essential text for those studying (and collecting) not just Thompson but related fields like New Journalism, the underground press, and the counterculture. An extremely useful book. And for those so inclined great fun too. If that was not enough, Shoaf, as with his Burroughs collection, donated his Thompson collection to a university, in this case the University of Santa Cruz in California. There is a great article in the local California paper that provides all the deets as well as some good quotes from Shoaf. It is great to see Shoaf getting some well-deserved recognition for his work in the bibliographical trenches. Oh, and by the way, he is also working on completing his bibliography on Tom Wolfe of Electric Kool-Aid Acid Test fame. Be on the lookout for that. As you can see, Shoaf is a busy guy, but not too busy for Burroughs (his first love??). In fact, Shoaf has started collecting signed Burroughs items once again and in the past 18 months or so has made quite a haul. But remember, Shoaf is not a mere collector; he is a bibliographer. And he is still finding unrecorded Burroughs items out there. Shoaf was kind enough to share with me his latest find: Anarchy: A Journal of Anarchist Ideas No. 24, Vol. 3, No. 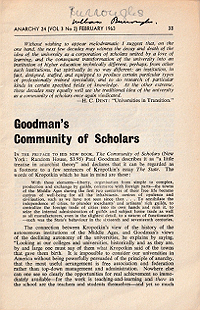 2 (February 1963). Anarchy was a monthly British magazine based in London edited by Colin Ward, which ran from March 1961 to December 1970. As you can see from Issue 24, the mag had some interesting design features as well. So much so that the covers for every issue are collected in Autonomy: The Cover Designs of Anarchy 1961?1970 edited by Daniel Poyner. 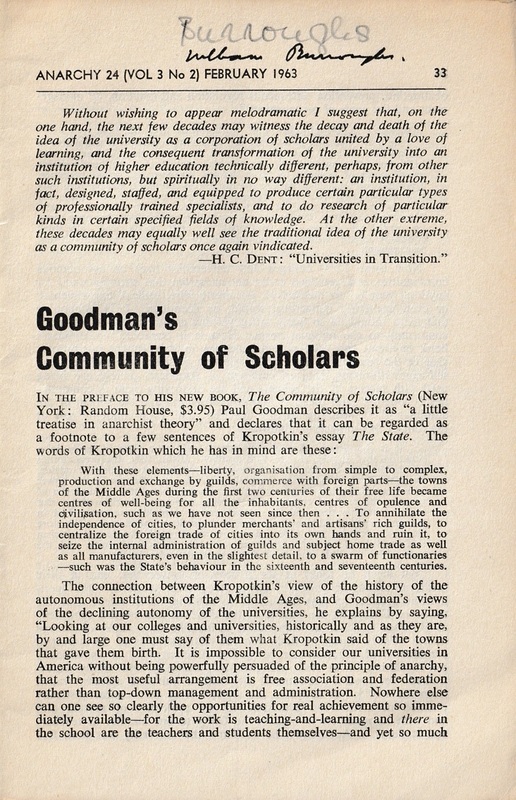 As for the Burroughs appearance, in a review of Paul Goodman’s The Community of Scholars, there is a sidebar containing Burroughs’ theory of bureaucracy from Naked Lunch. It is more than a quote and less than a separate appearance, but given how documented Burroughs’ bibliography is, finding something new no matter how small and seemingly insignificant is fun. And not only did Shoaf ferret this magazine out after years of neglect, he remarkably found a copy signed by Burroughs. From the looks of the scan it seems like a contemporary signature. One wonders of the circumstances that led to this magazine of all things to get signed. This appearance in Anarchy has some weight to it on the level of content as well. 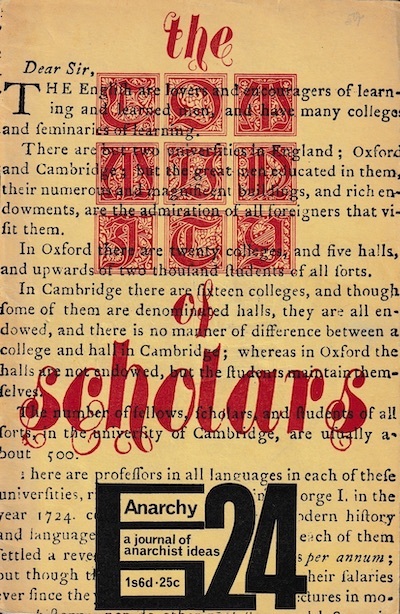 The presence of Burroughs in a magazine on anarchy and in a review critiquing the university system is food for thought and it reminds me of a friend of mine who is a professor at a major university with a specialization in bureaucracies and political organizations and institutions. Years ago, over a few beers, we talked about giving a presentation on Burroughs and bureaucracy and the quote featured in Anarchy would be a major part of the discussion. The fact that Burroughs is in Anarchy at all might have found its way into the project as well. Needless to say, the talk never happened as tends to be the case with most late night musings, but I saw my friend recently and mentioned the Anarchy appearance and he perked up. “Sounds interesting!” It most certainly is, as is the work that Shoaf is doing and continues to do in the world of bibliography and Burroughs.